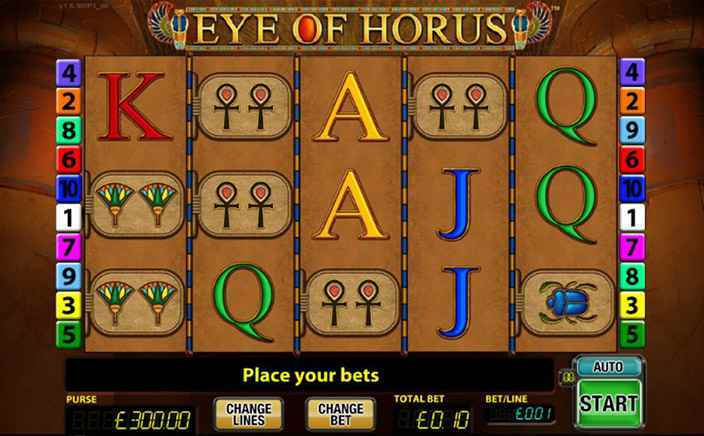 Eye of Horus is a video slot powered by Blueprint. The slot will take you back to an era of ancient Egypt where you will need to take help from the Eye of Horus that is the king god of Egypt to take you to the wins. The theme of the slot goes around an Egyptian God- Horus who has the human body and a falcon head. To start playing this slot, you need to place a bet that can range from £0.01 to £2.50. To start your journey, click on the Spin button to start the reels. There are ten paylines in this slot and you can select all at a time and set the number of coins to play. The several symbols of the slot include a scarab beetle, two fans, two ankhs, the Eye of Horus game symbol, and the ancient Egyptians playing the cards with symbols Jack, Queen, King, and Ace. The wild symbol is the Horus himself that can expand itself to cover the whole reel. It can substitute all the symbols on the reel except that of the scatter symbol- Temple. Eye of Horus has various special features for the players to get their hands on. 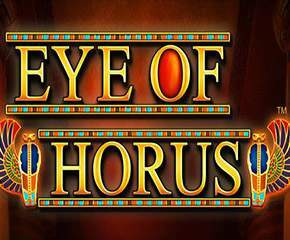 The top prize of the slot being 500x the total stake on the pay-line is awarded either once you land up with five ‘Eye of Horus’ symbols on the active payline. Free Spins feature get activated when you land up with three or more scatter symbols anywhere on the reels. Here, you will be awarded 12 free spins. Also, if you land up with any wild symbol during the feature, you will get an extra free spin and the lowest symbol will upgrade to one level up. The Gamble feature helps the players to gamble every win by guessing the correct playing card on the left-hand side of the reel. The wins can be doubled in the feature and the wrong answer will lead to losing all the money you have earned in the game. Overall, the slot has amazing graphics and sound effects giving great options to the players to make huge money. Having an RTP of 96.31% makes it a must play for all the players. The one thing which players love about this slot is that they can get their symbols levelled up in the free spins round.